Forum Packaging choose Codeology and A.P.Machinery to supply a complete end-of-line solution. Forum Packaging, the U.K. �s leading specialist paper packaging manufacturer, recently contracted Codeology and another system integrator to jointly design and commission a complete end of line carton filling, taping, labelling and collating production line to handle the high output from their new Garant T2B machine producing paper flour bags for the retail market. Forum initially called in Codeology for advise on their labelling needs. It was during that initial meeting that Codeology M.D. Jim Mason realised that Forum needed help and guidance on the entire end-of-line handling solution, not just labelling. Jim commented "Forum's needs meant that they had to minimise the end-of-line operations to allow operators maximum time to handle their new bag making machine output. It was obvious that a holistic solution was required with the entire line designed as one system for maximum efficiency." Jim then called in the system integrator, 'I have worked with this system integrator on many occasions and it is rare that we cannot work together seamlessly to design the correct solution for a customer." Together Codeology and the system integrator provided a design for a complete line incorporating all conveyors and taking into account the need to work with a metal detection system that differentiates Forum from the competition. The systems integrator provided a Soco F100 semi-automatic carton erector, Soco T10 case taper, driven conveyor and gravity collation conveyor. Codeology supplied a P100 Print and Apply labeller and iBar label design software. The complete line meant that cartons could be assembled, filled, taped, labelled, metal-checked and collated ready for palletising as efficiently as possible. The entire system was installed, commissioned and training completed in one and a half days. Forum M.D. Mark Spivey commented "We needed a system that was both low maintenance and efficient. Jim's advice has delivered a production line that works very well with the high outputs we expect from the T2B. 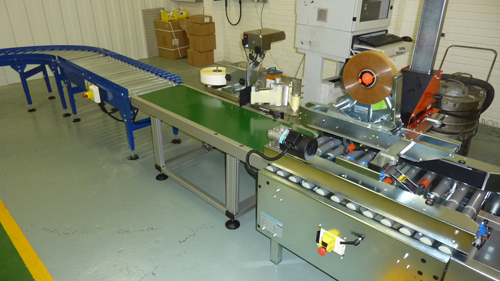 The label machine consumables are competitively priced, and the software is easy to use. Changeover is quick, and this fits in well with our philosophy of simplicity equals efficiency."